Playing in Europe is a career highlight for Matt Lowton. And he is determined that the adventure doesn’t end against Aberdeen. 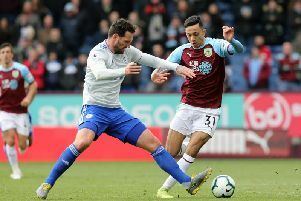 The 29-year-old has spent five of the last six seasons in the Premier League, with Aston Villa and Burnley, only making a step back to win the Championship in his first year with the Clarets. He also has continental experience, playing five games on loan in Hungary with Ferencvaros. But Europa League football is new for the Chesterfield-born right back, and he has his sights set on the group stages. Ahead of tomorrow night’s second qualifying round first leg tie at Pittodrie, Lowton doesn’t want the European tour to be over before it’s begun: “I can speak for myself, it’s definitely going to be a highlight up to now and hopefully we can get to the group stage and play in the Europa League proper. “It’s fantastic to reach this level. When you grow up you want to play first team football and then you get the chance to play in the Premier League, we’ve gone on again now and we’ve got the chance to play in Europe. “It’s a great achievement and we want to go up there and we don’t want it stop yet. “We’ve been looking forward to it, as soon as we qualified the lads were talking about it straight away and looking for the draw. It is something of a Battle of Britain, and Lowton sees much of Burnley in Aberdeen, who have successfully split the Old Firm, finishing runners-up to Celtic: “I suppose so, yeah. We probably did more than anyone thought we would last season to stay in seventh and get European football. Asked what he knows about the Dons, Lowton said: “Quite a lot, we’ve got a lot of reports from the scouts up there and a couple of the managerial staff have been up to watch them through their pre-season, so we know they’re a hard working team, solid when they get behind the ball, a bit like ourselves, so we’re going to have to work hard to break them down. “They’re a good team, we’re going up there under no illusions it’s going to be a difficult game.